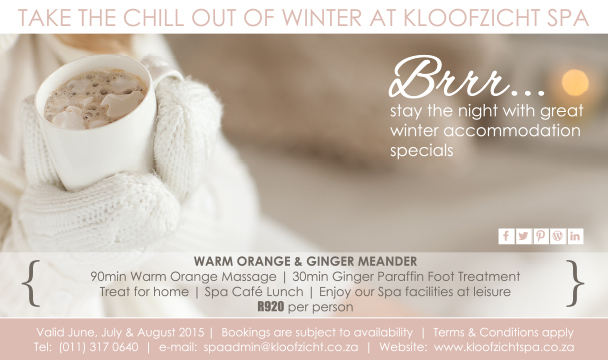 Want to stay within the city surrounds for your Winter Spa pampering? Fairway Spa is in the treelined suburb of Randpark, right on the golf course and has the following lined up for the month from June to August: At R615 per person, spoil yourself with a Cappuccino or hot chocolate, Hydrating facial as well as a Hot stone foot and leg treatment. Just an hour from Johannesburg and Pretoria, Askari Spa based at the Big 5 game reserve, invites Spa guests for a Hot drink with pastries on arrival, Hot stone rich body butter 90 min full body massage and aPedicure with paraffin dip at R850pp. All bookings can be made directly with the Spa in question. Refer www.guvonspas.co.za for info, images and contact detail. Previous postSPECIAL GOVERNMENT CONFERENCE RATES AT UMBHABA LODGE, HAZYVIEW. Next postSo how would you like your massage? With a Thai green curry?